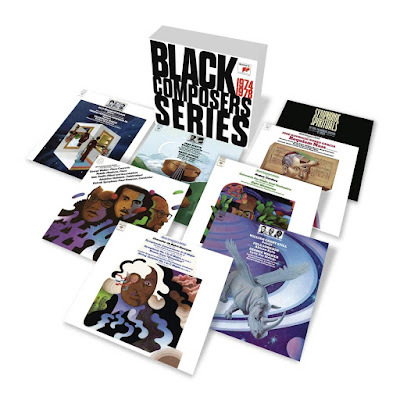 This is very much a labour of love, a 10 CD set on Sony Classical which re-issues recordings which originally came out on vinyl on Columbia Records in the 1970s documenting two centuries of music by Black composers. Originally made thanks to a collaboration between the Afro-America Music Opportunities Association and Columbia Records, the recordings cast their net quite widely with music by Joseph Bologne, Chevalier de Saint-Georges (1745-1799), Jose Mauricio Nunes Garcia (1767-1830), Jose White Lafitte (1836-1918), Samuel Coleridge Taylor (1875-1912), William Grant Still (1895-1978), Fela Sowande (1905-1987), Ulysses Kay (1917-1995), Roque Cordero (1917-2008), George Walker (1922-2018), Hale Smith (1925-2009), Thomas Jefferson Anderson (born 1928), David Baker (1931-2016), Olly Wilson (1937-2018), Talib Rasul Hakim (1940-1998), and Adolphus Hailstork (born 1941), performed by the London Symphony Orchestra, Detroit Symphony Orchestra, Helsinki Philharmonic Orchestra, Baltimore Symphony Orchestra and Royal Philharmonic Orchestra, all conducted by Paul Freeman, Juilliard String Quartet, Morgan State College Choir, Miriam Fried, Jaime Laredo, Sanford Allen, Aaron Reid violins, Faye Robinson soprano, Doralene Davis soprano, Betty Allen mezzo-soprano, William Brown tenor, Matti Tuloisela bass baritone, Janos Starker cello, Alain Planes, Richard Bunger, Natalie Hinderas piano and Denis Wick trombone. As can be seen from the above list, the recordings did not stint on the performers and the discs include some significant ensembles and names from the period; there is little to complain about in the standard of recording. Whilst, if the collection was made today we might make a different selection of composers, it has to be admitted that the organisers have cast their nets quite widely with composers from the UK, France, Cuba, Panama, Nigeria as well as the USA. Perhaps the most significant omission is that of Black women composers, not even Florence Price. Wikipedia currently lists 29 composers in its African-American female composers category, but I suspect that this knowledge is rather recent. When I interviewed Shirley Thompson [see my interview] she was candid about the lack of representation on the classical music courses as a woman of colour, something which is now only gradually changing. So, these discs are very much a snapshot. Sony's presentation reflects this, each CD is a copy of the original disc and comes in a sleeve which reproduces the original vinyl disc sleeve (so you need good eyesight or glasses to read the original sleeve notes). This means that each disc comes in at around 40 plus minutes, but preserves the original presentation. The discs are not recorded chronologically, so there is something delightfully serendipitous about the listening experience. And the embarassing this is, despite these recordings being in the public domain for over 40 years, many of the composers were names that were new to me. The conductor for all the orchestral works, and the artistic director of the series was Paul Freeman (1936-2015), who trained at the Eastman School of Music and spent two years at the Hochshule für Musik in Berlin on a Fulbright Scholarship. He founded the Chicago Sinfonietta and was music director of the Czech National Symphony Orchestra in Prague. The discs start with Joseph Bologne, Chevalier de Saint Georges, an 18th century Frenchman born of a slave mother who became one of the most famous musicians in France. Here we have a selection of his music, Mozartian in cast but in rather solid, very non-HIP performances, neverthless the disc makes you want to explore more. Volume two pairs music by William Grant Still with that of Samuel Coleridge Taylor. Here we hear Grant Still's Afro-American Symphony which combines Afro-American melodies and jazz inspired moments (Grant Still played the oboe in the show Shuffle Along) into a symphonic work which made history when it became the first time an American orchestra played a symphonic work by a Black man. Coleridge Taylor, a student of Charles Villers Stanford, is becoming known for far more than Hiawatha, but it is good to have him on the discs and here we have the Danse Negre and of course 'Onaway! Awake, Beloved' from Hiawatha's Wedding Feast. And we have to remember, this was an American record set and the piece sets a poem by a famous American writer. With volume three we go into rarer territory, Ulysses Simpson Kay and George Theophius Walker. Kay was born in Arizona, came from a jazz family and was mentored by William Grant Still and he had a Fulbright Scholarship to Rome. We hear Markings, from 1966 written in memory of United Nations Secretary General, Dag Hammarskjold, a striking work, very 20th century with moderinst hints. Whilst Walker's Trombone Concerto is an interesting combination of instrument and orchestra, with some striking writing and jazz hints. Walker studied with Nadia Boulanger and is the only Black composer to have won a Pullitzer Prize. Roque Cordero is the only composer on volume four. Born in Panama he was a composer and conductor, though his career was based mainly in South America. His Violin Concerto was written for Sanford Allen, the first black member of the New York Philharmonic Orchestra, it is a work which combines expressionism and neo-classicism and rather reminded me of Hindemith's later style. It is played here by the dedicatee. Also on the disc is a set of smaller pieces, here popular styles creep in and the music is also more intense. With volume five we jump back to the late 18th and early 19th century with Jose Mauricio Nunes Garcia, who was born of bi-racial parents in Brazil (where the Portuguese used enslaved Africans). Remarkably he was able to enter the church and wrote a considerable amount of music. His Requiem Mass is a large scale choral work with soloists, a work definitely worth exploring though the performance here is rather overblown and solid, lacking the feel for period performance which we might expect nowadays, so the recording itself is something of a period piece. The Cuban composer Jose White was the the son of a French businessman and an Afro-Cuban mother, and he was able to train at the Paris Conservatoire. He developed into a notable violinist and his Violin Concerto of 1864 was premiered in 1867 with the composer as soloist. It is a large-scale work, the orchestral introduction is substantial in its own right, and much of the Romantic writing rather reminded me of Bruch. The disc also includes the Cello Sonata by David Baker, a jazz-trombonist who learned the cello after a facial accident. The work plunges straight in and is notable for the way it mixes advanced harmonies with blues and jazz. With volume seven we return to William Grant Still, his ballet Sahdji from 1931. The music, for chorus and orchestra, was the result of Grant Still's first exposure to music from the African continent, though Grant Still's attempts to incorporate this into his style led to a great deal of frustration, the result here is very colourful and lively. Next comes a suite of music by Fela Sowande, who is very much the father of Nigerian art music [see my interview with pianist Rebeca Omordia], these combine mid-century classical string writing with African rhythms and melodies. Finally, another string piece, Lyric for strings by George Walker. Volume eight starts with the very contemporary sounding and highly dramatic Akwan by Olly Woodrow Wilson for piano, electric piano, amplified strings and orchestra. Wilson studied at the University of Iowa and wrote commissions for the New York Philharmonic and Chicago Symphony and many others. As of the time of writing, Thomas Jefferson Anderson, Jr. was still composing and his Squares was written in 1965 for West Virginia State College. It is a colourful, very 20th century-sounding work. Finally on this disc Visions of Ishwara, by Talib Rasul Hakim, written in 1970 by a composer from North Carolina who changed his name when he converted to Sufism. Volume nine returns to George Walker for his large scale Piano Concerto, alongside Adolphus Hailstork's short, but striking Celebration and Hale Smith's Ritual and Incantations. Hale Smith was born in Cleveland and attended the Curtis Institute of Music, becoming a music editor for music publishers and arranging spirituals for Kathleen Battle and Jessye Norman. 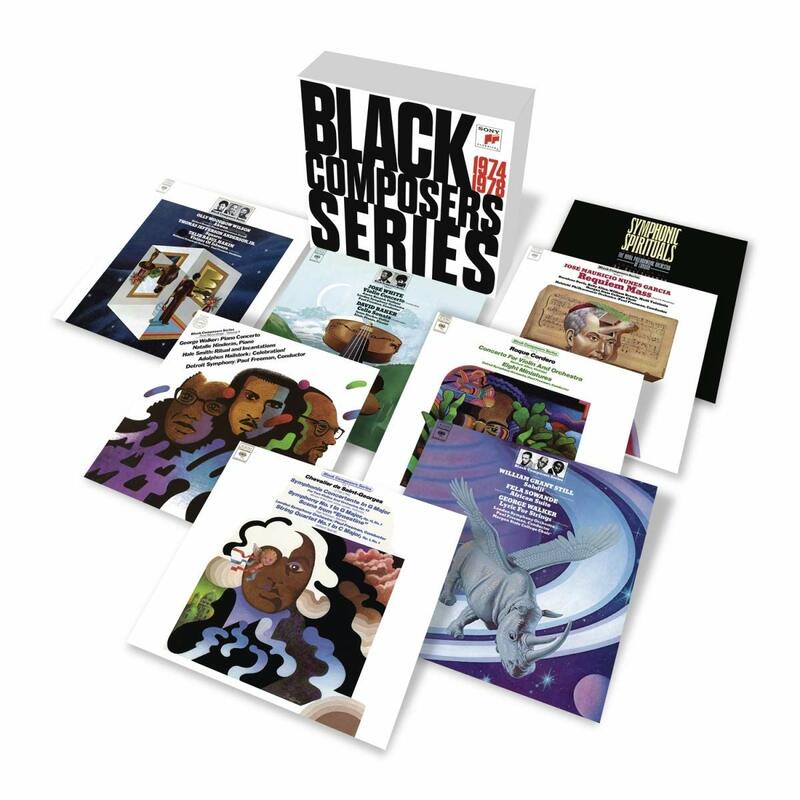 The final disc is also something of a period piece, a programme of spirituals in orchestral arrangements by Hale Smith, Donald Erb, William Brown, Frederick Tillis, and Morton Gould. 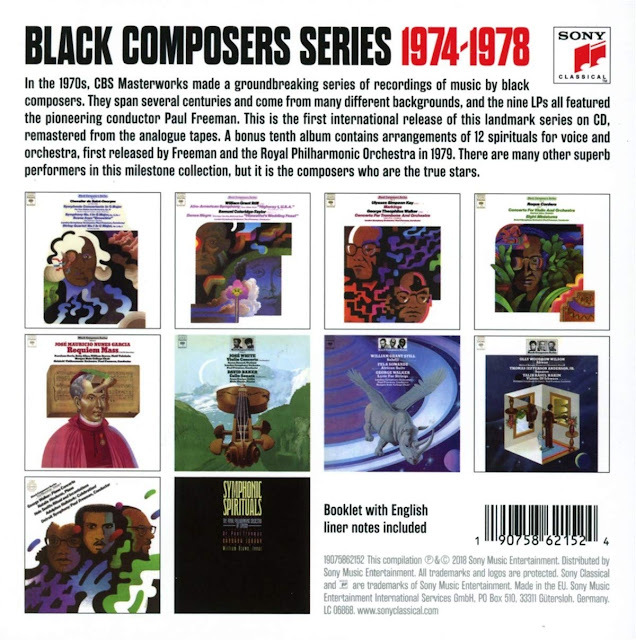 Black Composers Series 1974-1978 - Sony Classical, 10CDs, available from Amazon.